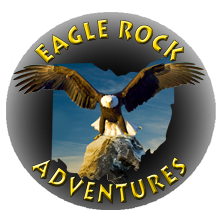 Eagle Rock Lodges offers the secluded getaway you have been looking for with the all the amenities of home and a quiet picturesque setting on 250 acres of private property known for its rolling hills and year round natural beauty! We are conveniently located near Salt Fork State Park and Kimbolton in NE Guernsey County Ohio. This beautiful property is located about 8 miles from I77 at #54 exit (Kimbolton/Plainfield/SR 541) and a convenient distance from the Salt Fork State Park. We are the premiere luxury lodge and outdoor property in the greater Salt Fork region of Ohio. Expect to be in awe from the time you begin the drive up the lane and amazed when you enter the Lodge! With 25ft ceilings, this lodge is big, open and perfect for families, couples, and small groups (up to 10). It has 2 bathrooms, lots of beds (2 queen, 3 full and 4 twin), a fully equipped kitchen and a great room with a gas log burning fireplace and 46” HD television with satellite/cable. The lower level offers a large sitting room along with another gas log fireplace and 40” HD television with a DVD player as well as a gaming/playing area. The Lodge is surrounded on two sides with a deck for outdoor eating and sitting. The Lodge is secluded on its own private drive tucked away amongst beautiful shade trees and overlooking one large and two small ponds. Hiking trails and path meander around the property for your enjoyment and exercise. You will also find your own floating dock anchored to the shoreline of the large pond providing a site where you will be able to fish in private and watch the geese flock in as the sun sets down on the water. If you are quiet and in the right place at the right time, you may see deer and wild turkey from the deck of the Lodge! 2 bedrooms w/ queen beds, full bed in the loft, an extended sleeping loft w/ 4 twins and a full bed, full kitchen, main floor great room and an additional full bed on the lower living/entertainment area. Glass atrium/patio room for year round use. Campfire ring/pit with cut firewood provided. You must be 24 years of age or older to make a reservation.